Free download FastStone Image Viewer latest version 6.1. It helps you not only to view images, wallpapers, photos and landscapes but also enables you to edit all. FastStone Image Viewer makes it easy to view the pictures with full screen mode. You do not need to apply option for full screen view. It has the default view of full screen. 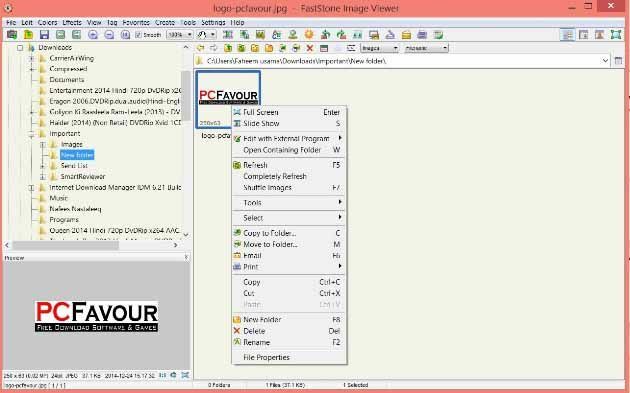 Installation of FastStone Image Viewer is very easy. After installation, you can open image using this image viewer with 2 simple methods. First one is directly open and the second one is by opening the FastStone Image Viewer program from the desktop. When you will complete the installation, you are required to make it your default program to view images. To do this, right click on any image and move your mouse point to “Open with” and now click on “Choose default program…” . You will see all relevant programs for image view. As you have installed the program FastStone Image Viewer recently so you will not see it. Now click on “Browse” from bottom right and open the folder “FastStone Image Viewer”. After opening the folder, double click on “FSViewer”. Now this program will be added to the program list. If you want to make it your default image viewer then make a check mark on “Always use the selected program to open this kind of file” otherwise uncheck it. Now this program will be added to “Open with” program list. FastStone Image Viewer has all options you need to edit your images. It is also a quick photo editor. You can adjust the color, levels, lighting etc from Colors menus. If you want to apply some effects on image then you can use Effects menu and apply Frame Mask, Watermark, Oil Painting, Lens and many other effects on your images. You can easily resize your image from edit menu.